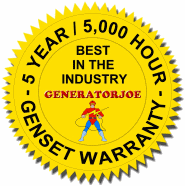 Largest online selection of Industrial NG/LP Single Phase generators from GeneratorJoe. These generators are propane or natural gas fueled. NG & LP generators, 25,000 watts (25 kW) to 150,000 watts (150 kW). Gaseous engines from GM, PSI & PSI Heavy Duty.